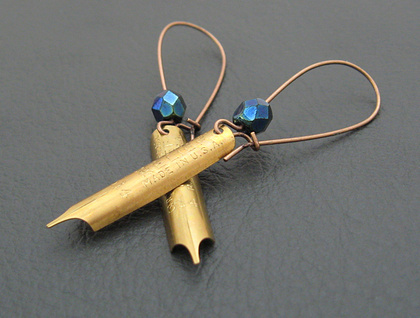 Old brass pen nibs have been carefully drilled, and hung on antiqued copper ear-wires. 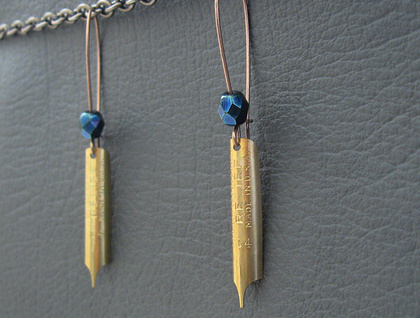 Above each nib, adorning the ear wire, is an iridescent, dark blue, faceted, Czech glass bead, like a drop of ink sliding down the wire. The pen nibs came in a small, battered, old red box, which says that they were made in the U.S.A. by The Esterbrook Steel Pen Manufacturing Company, established by Richard Esterbrook in 1858. While I don't know how old the pen nibs themselves are, they are probably vintage (twenty years old or older). Each one is stamped 'R. Esterbrook, 314 Relief, Made In U.S.A.' They have a wonderful, old gold colour, which complements the deep inky blue of the faceted glass. Czech glass is famous worldwide for its high quality. Firepolishing is a technique whereby the beads are 'polished' by subjecting them to a very hot flame, creating a bright, shiny surface. Firepolished glass sparkles almost like crystal. 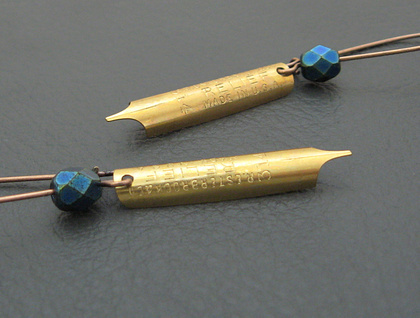 A fabulous gift for a writer or reader, the 'Pen And Ink' earrings are lightweight and easy to wear. They measure 62mm from top to bottom. The nibs are 31mm long, and 6.5mm across. 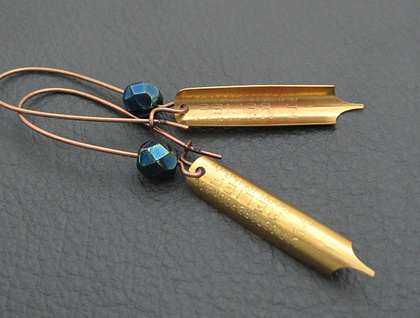 The kidney-shaped ear wires are copper based and nickel free, so most sensitive ears should be fine wearing these. While it is unlikely that the glass beads will work their way off the ear wires, it is recommended that you keep the ear wires closed, just in case the beads manage to slip off and get lost. Keeping the earrings hanging, rather than jumbled up in a jewellery box, will help to ensure that the ear wires do not get opened or bent by other jewellery pieces pushing against them.